When I'm really into something, whether it's trying to debug some code or work out a design that won't gel, I forget about everything else, including eating. Then, hours later I raise my head out of the mire and I'm starving and ready to eat everything in sight - usually stuff like potato chips and cookies. That can't be too healthy, so I've really tried to keep around non-distracting yet reasonably healthy things to snack on while working (and a bottle of water too). Fresh, portable fruit like apples and bananas are great of course. So are nuts, but while nuts are quite healthy overall, they are also very high in calories. And a handful of dry-roasted peanuts, which could be about half a cup, is more than 335 calories. So some time ago, I switched to using beans in snacks. Chick peas are perfect for this since they cook relatively fast because of their rather thin skins, and a cupful is around 270 calories. Even with the added olive oil, 3 tablespoons for the whole batch, it's still quite lower in calories, and quite tasty too. (Source for calorie figures: Calorie Count.) A half-cupful is just as filling as the equal amount of nuts. Incidentally, the German word for chick peas is kichererbsen, which literally means "giggling peas". Whenever I ask the Taste Tester to bring home some chick peas from the store he feels obliged to giggle like a girl. I try to remember to bop him one when he does it, but the tough love approach isn't curing this odd affliction so far. Note, I do cook dry chick peas since they are so much cheaper than the canned kind, and as I've noted above they cook relatively fast compared to other beans. 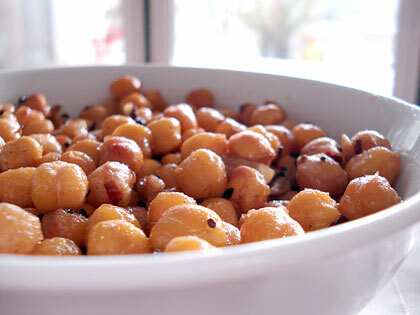 If you are in a hurry or can't be bothered, use canned, drained chick peas. Sort the chick peas (take out any discolored ones) and soak in water for several hours or overnight. Drain. Place in a pot, add water so that it comes up to about 2 inches / 5 cm above the chickpeas, and bring to boil; lower the heat to a simmer, and cook for about 2 hours, until the peas are tender. (If you use a pressure cooker, you can cook then in about 15 minutes without soaking.) Drain. You'll have about 6 cups of cooked chickpeas. Peel and chop the garlic cloves rather coarsely. Store this in an airtight container in the refrigerator. Makes a great beer snack. You can make it sweet-spicy by sprinkling over some brown or raw sugar to while it's still hot from the oven. You can find onion (nigella) seeds and other spices at an Indian grocery store. Online you can find them on the Amazon Gourmet store. The seeds can turn a little bitter after roasting. I like that bitterness but if you don't, just leave the seeds behind when serving the chick peas. The flavors will still be there. Or, add them later on in the cooking process, with about 10 minutes to go. Submitted by maki on 2006-09-28 19:40. Sounds good. I'm always on the lookout for tasty, crunchy snacks, and if they're healthy, all the better. I'll have to give this one a try sometime. danke für die schöne Anregung. Have you used canned chick peas for this? I just don't like these but my husband loves them. He often mixes them with a vinegarette and eats it as a salad. It is good for joggers the day before a long run-so he says. Michael, you can use canned chick peas (just scale down the amount of spices according to how much you have, remembering I started out with about 6 cups of cooked chick peas). I would rinse them briefly since the liquid that canned chick peas come in tends to be goopy. Yep, I tried it this afternoon, and it worked great. I couldn't find nigella seeds anywhere here in Singapore, but everything else was fresh spice. I like to go heavy with cumin, it's such a great taste. When I served the dish (still warm) I squeezed the other half of the lemon over the chick peas and it gave them a nice tang. The only mistake I made was measuring the chilli flakes in the palm of my hand. My palm has burned all day long, like a chilli stigmata. This is such a beautiful dish to have with a Kirin. I'm going to prepare some more preps of this to keep in reserve next time I want a thirty-minute snack. Your next programming challenge: make it so the recipe portion of your posts can be easily printed, on one sheet. i am a student studying an ICT GCSE at King Ecgbert's school and i am writing for you permission to use the image of the bowl of chick peas. the image will only be used in my school project and will not be published commercially. Chris, you are welcome to use the image as long as you attribute it to me (just put somewhere that the image is from justhungry.com). Good luck with your project! I've made this a handful of times since it was first posted (I was coming back today because I wanted to be sure on the temp and time). It's always great. I've tried a variety of seasoning options; one of my favorites is sea salt, dill, olive oil, and a bit of lemon juice. Thanks again for posting this, these are great. I'm soaking some chickpeas for this right now. After they are soaked and you put them back in water for 2 hours, I assume you're supposed to be boiling them, right? Can't wait to try them! these are great to eat! Sweet crunchy chick pea snack? Do you think there are any other beans we could use with this idea? Just the thin skinned ones? I've seen green peas, and another kind of bean fried as a snack. 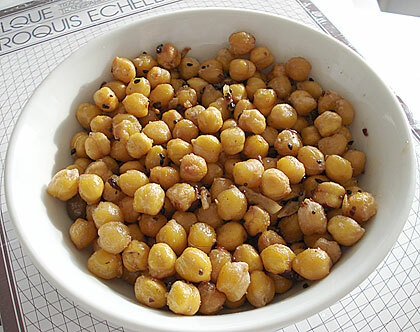 Just made these from canned chick peas, seasoned with: 1 garlic clove, mustard powder, paprika, ground coriander, celery salt, sea salt, lemon juice, and some olive oil. Absolutely delicious, thanks for sharing!!! So, after you soak them for hours, when you put them in water again for 2 hours, are you simmering them? Or are you just letting them soak again for 2 hours? These are amazing! As a vegetarian, it can be tricky to get enough protein, but regular beans can get a bit boring. Thanks for opening my eyes to a great snack option! I plan to try this with some other types of legumes soon (wasabi peas, for one). Do you have any suggestions on what else might work well (and what may not)? Do you know how many calories are in a serving? They're pretty filling, but I still ate ~1.5 cups (of cooked beans, before drying them) in a day and a half. Thankfully they don't seem to cause digestive issues as much as regularly cooked beans! Hey, I'm going out of country next mo and am looking for snacks to pack. I've never made roster chick peas but they're drying on the counter now!! My question is (I've been trying to find online for this answer) how long could these keep in container non refridgerated? I'm on a kick to make plenty of nutritious snacks to pack!